The torque meter PCE-TM 80 with external sensor to measure the torque moment in screws, components, switches, transmission shafts, etc. The torque meter PCE-TM 80 is an affordable solution to easily perform torque measurements. The torque meter PCE-TM 80 operates by rotatory movements to the left and right and it is ideal for the torque moment. The torque meter PCE-TM 80 offers the possibility (according to the application) to enlarge 1 digit resolution. 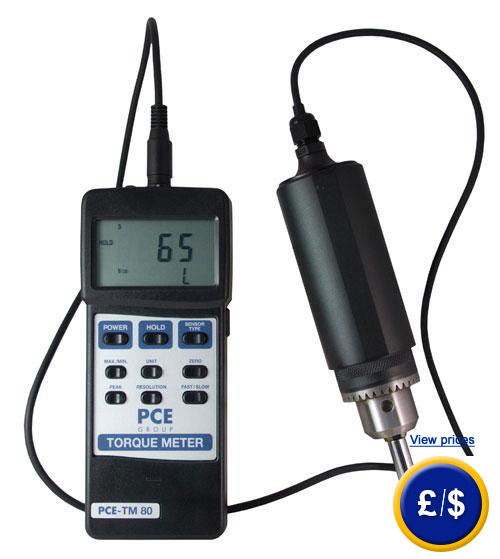 The torque meter PCE-TM 80 shows the Peak value as well as the max. and min. values. By means of the optional software real-time data can be continuously transferred to a PC or portable computer. 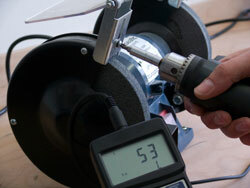 The torque meter PCE-TM 80 is very solid to ensure both long lifespan and reliability. Here you will find an overview of all the torque meters available at PCE Instruments. For companies that wish to include the torque tester into their internal quality control system of tools or for annual calibrations. The certification meets ISO standards and includes a laboratory calibration and a certificate which contains the measurement values. Software kit including the PC RS-232 data cable. The software is used for the direct transference of data from the torque meter to the PC or computer. Data can be also transferred to other calculation programs such as MS Excel. If your PC or portable computer has only USB ports available, use of the USB-RS232 adapter will be necessary.